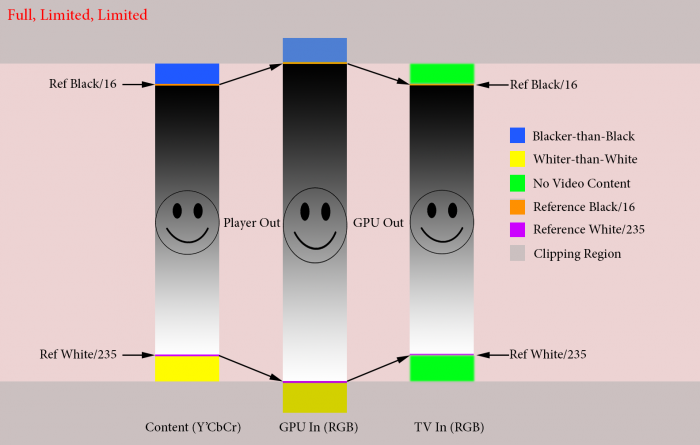 Colorspace YUV/RGB problem / GPU's RGB Full range setup? I accidentally found, when testing with projector, that C2 sends output HDMI as YUV (projector cant determine correct limited/full range automatically, and shows dark too deep without details). And projector correctly shows RGB, and also TV correctly reacts, when trying limited/full range from TV menu. echo "rgb,8bit" > /sys/class/amhdmitx/amhdmitx0/attr or echo "rgb,10bit" > /sys/class/amhdmitx/amhdmitx0/attr and refresh resolution, projector shows RGB and colors are fine, and also correctly determined by Automatic function of projector (which wasnt the case for YUV). I am not sure, if correct settings is 8b or 10b, but I would definitivelly want to Full RGB output. Could this be fixed? Or, even better, maybe setuped from CoreELEC settings (if Full RGB isnt optimal/default value nowadays)? Could you please try to set “disable auto colour depth switching” in “settings > system > CoreELEC”? Seems that disable auto colour depth switching doesnt have any influence, on both (YUV/RGB, Automatic range (video/pc signal) function on projector). Projector and TV are acting the same. I dont know how to show YUV/RGB mark on TV. Automatically choose wrong limit range of video: Video signal -> darkens blacks too much, without detail. When I manually switch to PC signal @projector, picture seems to be better/OK. Choosing between Full and Limited range on TV doesnt make any difference, picture has not darkened black or goes significantly grey. Odroid C2 + echo “rgb,8bit” / echo "rgb,10bit"
Automatically choose Video signal -> Picture is fine. When I manually switch to PC signal, image is “too gray/washed out”. Automatically choose Limited Range and picture is fine. When choosing Full Range, image is “too gray/washed out”. Odroid C2 + echo “full,rgb,8bit” / echo "full,rgb,10bit"
Automatically choose PC Signal signal -> Picture is “too gray/washed out”. When I manually switch to Video signal, image is fine. Automatically choose Full Range and picture is “too bright/gray”. When choosing Limited Range, image is OK. Automatically choose Limited Range and picture is fine. When choosing Full Range, image is"too gray/washed out". Automatically choose PC Signal -> Picture is fine. When I manually switch to Video signal, image is too dark. Automatically choose Full Range and picture is fine. When choosing Limited Range, image is too dark. After reading https://kodi.wiki/view/Video_levels_and_color_space, maybe Limited on TV/projector side isnt bad (in case TV supports infoframe informations). I understand, I must differentiate Kodi output, and Odroid output. When I tested black clipping from AVS, I didnt see anything under 16… Which doesnt mean necessary problem, and would be result also for F-F-F or F-L-L chain. If you used the Limited -> Full -> Limited combination (and disabled hardware decoding) you can verify everything is working by playing the Black Clipping Pattern and verifying that you can get levels below 16 to flash when you raise your TV’s brightness setting. But this could be slightly different thing, because I didnt see them also on Rpi, so I dont want to mix things together - this could be related to the Kodi output (range) itself. After this I could think about “next chapter”, Kodi output (Full/Limited), to get best outcome L-F-L for optimal results without scaling. But if I wouldnt have option to choose F/L on Kodi side (and so far, my tests results seems that Kodi in CoreELEC goes Full, without option to change), I would definitivelly prefer F-F-F (as before with Rpi setuped to Full RGB, single scaling) before F-L-L as I assume I have now with Odroid + echo rgb,10 (Double scaling - possible banding). For the Rpi, it looks like the Kodi option is gone, but I would like to know, how its in the case of Amlogic/Odroid. I read this discussion, where stated “range of RGB isnt setuped by HK Linux”, but I think this could be misunderstanding when talking about Player(Kodi) and platform (HK Linux). Kodi @Rpi doesnt have this option, but Rpi platform actually could be setuped the range via parameter. And also linux has xandr option to setup RGB range. Kodi Linux mentions VAAPI, where (from the Kodi 18 + Ubuntu 18.04) should be possible choosing Limit / Full, instead going always Full (ie, until 18 Kodi option to change range doesnt Apply). Have no further details how its on Amlogic. Kodi can be set to use limited video levels through the settings menu. 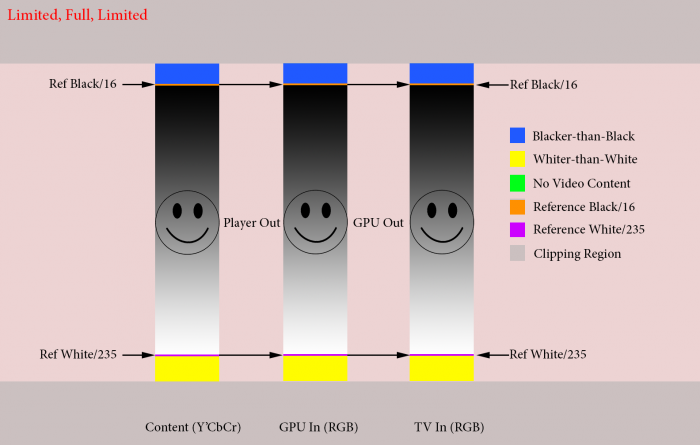 Your GPU can (and should) be set to output FULL video levels by running the > command: xrandr --output HDMI1 --set "Broadcast RGB" "Full". That is a lot of information to sort through. Let’s see if I got the important parts of what it is you are trying to say here. Your problem is that colours are too dark when you use the C2 with your projector? Manually changing the C2 to RGB output or changing the projectors display mode to PC, will improve the picture? By default, Odroid C2 seems to use YUV444 Colourspace (by design?). The projector automatically doesnt recognize correct Color range (limit/full). I can set up correct level manually, just the Automatic option on projector choose wrong range. TV shows picture “fine” (not dark, not washed), but for some reason TV settings Full/Limited video range doesnt make any difference. I would like to use RGB - RGB video range is correctly detected both Projector and TV, and I can see TV settings Full/Limited makes actually changes, when switched, as it should. I am trying to setup best possible outcome. And from the 3 correct levels options, regarding GPU, the best should be use Full range. Full-Limited-Limited – This should be avoided since there are two levels of scaling which will likely cause unnecessary banding. And I try to find the way, how I could change it. I cant test xrandr --set "Broadcast RGB" "Full" (linux way) as this is not present in CoreELEC. Interesting. I have just started looking into a banding issue I was having when this thread pops up. Using an Odroid C2 attached to a Panasonic Plasma. I also tried “disable auto colour depth switching” with no effect. Previously had an Intel system with LibreElec attached to the Plasma, with little banding noticed. I have not tried switching output between YUV and RGB, but the video range discussion caught my eye. Based on my understanding of the Amlogic HDMI driver, the dmesg echo (hdmitx) is showing the colour range that the HDMI connection is at (ie. transmit). GPU processing supposedly is “Auto”, but I never found a reference for that info. If the display negotiates as LIMITED, it outputs as Limited. Now, supposedly in the HK 3.14 kernel this is controllable, https://forum.odroid.com/viewtopic.php?f=135&t=26003 but broken (?). However in the CoreElec 3.14-Nougat Kernel, that routine is rewritten https://github.com/CoreELEC/linux-amlogic/blob/amlogic-3.14-nougat/drivers/amlogic/hdmi/hdmi_tx_20/hw/hdmi_tx_hw.c so I’m not sure if HDMITX_DWC_FC_AVICONF3 is controllable. As for controlling the colour range within Kodi, the option was removed as it apparently didn’t work. https://discourse.coreelec.org/t/rbg-full-and-limited-range-selection/2001/3. Would need to look back as to when this was reverted versus when the Kernel was switched to Nougat, as I suspect the HK Kernel bug is why the switch didn’t work. There is nothing wrong, you can enable full range by doing the following. I don’t see this helping you in any way though, full range is for PC monitors and x86 predominately. Source and output have to match, it doesn’t matter if you run in full mode as 99.9% of content is encoded with limited colour range, even the content on 4kmedia.org which is some of the highest bitrate samples available is encoded with limited range. You can add the full and 8bit rgb together if you want to. If there is an avr connected between your device and the TV, check the settings on your avr to make sure it’s not the cause of your problems. adamg - I know this could be maybe nitpicking here (if we take out projector inability to automatic setup YUV color range), but I just try to set up video levels… I agree that most importantly is correct video level, it just there are different methods, how to get it (colorspace transformations, no scaling/one scaling/two scaling), and for possible best results it would be good to have this process controled (on Rpi for example, no controll level on Kodi, but at least GPU can be controlled). Or at least, if its automated somehow, would be good to have ability to check, which option we using. Thanks for the full tip. So, I am not sure how much I can trust actual hdmitx information (and what really means). I know, the same TV detects Rpi Full/Limited accordingly (switching TV to not-corresponding range with Rpi hdmi pixel settins results washed out colours or darkens black). Therefore I think, there is something strange on Amlogic platform, as smf007 mentions and I am not sure, if this relies more on source (kodi) side, od GPU (amlogic driver) side. 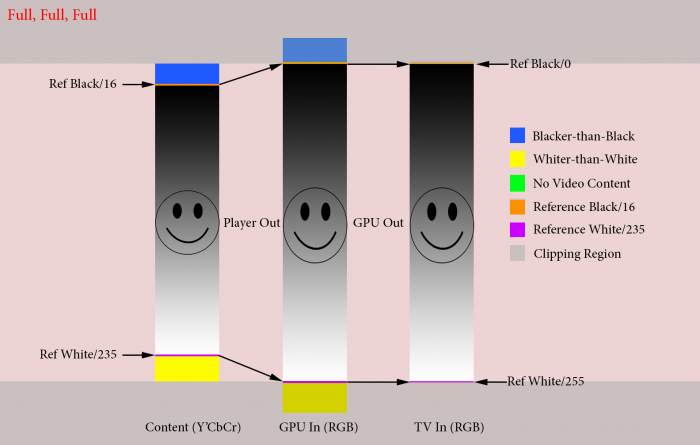 Limited, Limited, Limited – Video Level WRONG : Washed Out Colors, Present colours blacker than black (0-15) as reference black and whites whiter than white accordingly. and I dont feel that way actually (at least on the first sight, I didnt do proper full test with greyscale patterns etc. which I will do when I got back from work). and again, I dont see crushed blacks on first case. Contrary, I see washed out colour when I try switching to hyphotetical Full, Full, Full. smf007 - good finding, thanks for information. It kinda concurs with my observations. but from tests I did so far, i am thinking that its 2., and color range hdmitx switch doesnt actually switch GPU output range (will test more thoroughly later), on the other hand its not obvious, what part of signal chain this option affects (if any). P.S. : I updated my previous post to contain all otions, which could be affected by user and their outcomes. I did some more test with Greyscale patterns. First, one correction. When is Odroid setuped to the RGB Full, TV in Automatic detects it as Full Range, but the image is “greyed/washed” - acts as Limited signal range. After switching TV to Limited range picture looks OK.
Second. I didnt see BtB/WtW in any settings on Odroid and Rpi. That would mean, that Kodi player sends the signal always converted as Full on these platforms. 3. Full, Limited, Limited -- Video Level CORRECT : WtW & BtW Clipped, Double scaling (possible banding). Full, Limited, Limited -- Video Level CORRECT : WtW & BtW Clipped, Double scaling (possible banding). On the other hand, when I did horizontal banding test on greyscale ramp, results from Odroid C2 seems better than Rpi (RGB full) to me. I can see banding in both cases, but in Odroid case its more detailed (not so big steps as in Rpi). I didnt see difference between RGB and YUV in banding test on Odroid. YUV444 is default, and some Displays could have trouble to automatically choose correct video range. Could be fixed by their settings. There is something fishy between (/in) Kodi<->GPU<-> code, which doesnt allow Full range output for GPU. We can change hdmitx parameter, but it doesnt have actual influence on picture (just to some information send along to the TV/projector with signal I guess). This seems to be thing for Amlogic (I saw also similiar discussions @Vero forum etc. ), and its not YUV/RGB specific. Although video levels and colour specs arent best case, basic test seems to have quite nice outcome.